MM developed this tool to help with the removal of the stock rubber bushings from the IRS subframe. Not only does this tool make the job much easier, it also reduces the time spent removing the stock bushings by at least an hour. Pay only $19.96 when you purchase the MMT-6 tool along with the MMIRSU-1 or MMIRSU-2 bushing kits. If you buy both items separately, your discount will be applied by our salesmen when your order is processed. It won't appear during check-out. 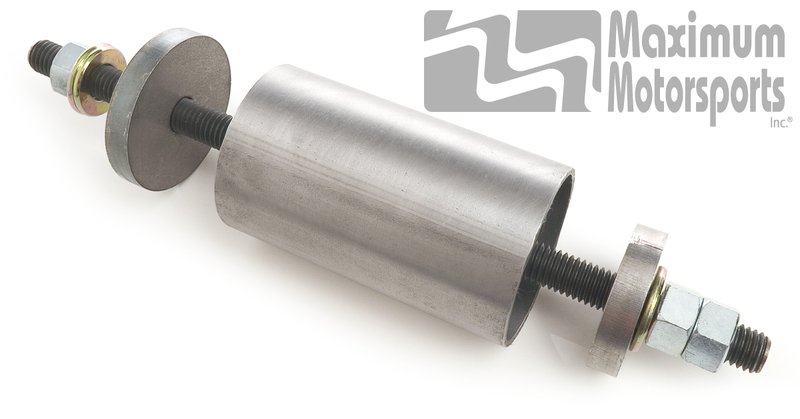 Purchase this tool as an option from the subframe bushing page and it applies the discount automatically. You can read Maximum Motorsports' highly detailed MMT-6 Subframe Bushing Removal Tool installation instructions before purchase. Due to the limited space envelope around the IRS Subframe, Maximum Motorsports highly recommends the complete removal of the IRS subframe from the vehicle. Installation time and frustration will be greatly reduced.